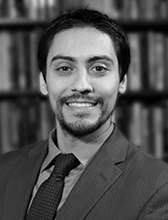 Alejandro J. Beutel was Researcher for Countering Violent Extremism at the National Consortium for the Study of Terrorism and Responses to Terrorism (START). In 2017 he became a Senior Research Analyst at Southern Poverty Law Center’s Intelligence Project where he monitors U.S. far-right extremism and hate. Prior to START, Beutel was the Policy and Research Engagement Fellow at the Institute for Social Policy and Understanding (ISPU), an applied research think-tank specializing in the study and promotion of evidence-based development strategies for positive civic, social, and political engagement outcomes for American Muslim communities. He was also an independent research consultant to several non-profits, private corporations, and think-tanks. Beutel graduated from the University of Maryland, College Park in 2013 with a Master of Public Policy. He also has a Bachelor of Science in International Relations and Diplomacy from Seton Hall University in South Orange, NJ.